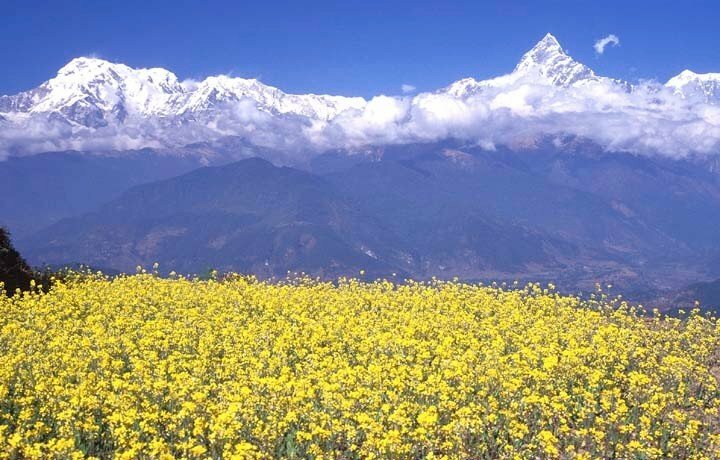 Sarangkot is the most popular tourist destination from where the tourists can enjoy the great view of the Pokhara Valley and the magnificent view of the mountains such as Annapurna Massif, Fishtail Mountain, Dhaulagiri range, and Manaslu. 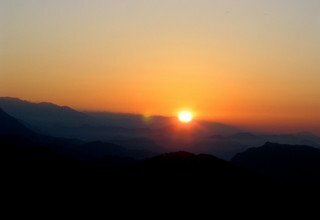 Sarangkot is only 5 km from Lake Side from Pokhara and highest view point at 1592m high for Sunrise and Sunset view over the snowy peaks. 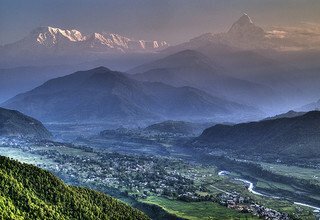 Sarangkot can be reached easily by 45 minutes by a car ride to the top from Pokhara and then 45 minutes hike up to the main view point. Paragliding can also be done from Sarangkot. From Sarangkot, on the northern direction we can see Dhaulagiri in the far west. 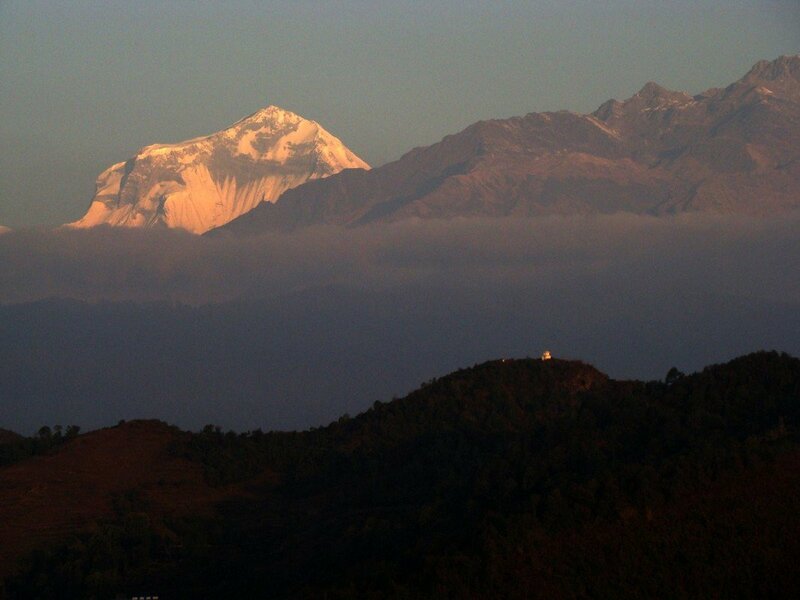 Annapurna range is visible when the weather is clear on the same side. On the southern direction the village overlooks the city of Pokhara and its lake on the north-western outskirts of the city. Paragliding in Nepal can be a truly wonderful and fulfilling experience for the adventure seeker. A trip will take you over some of the best scenery on earth, as you share airspace with Himalayan griffin vultures, eagles, kites and float over villages, monasteries, temples, lakes and jungle, with a fantastic view of the majestic Himalaya. 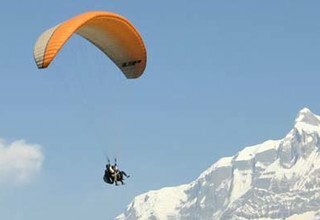 Paragliding is another adventurous activities being carried out in Nepal to amuse the visitors. 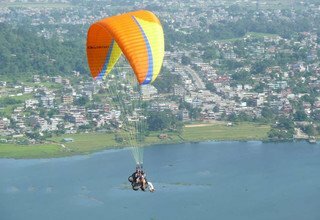 There are various places suitable for organizing paragliding but Sarangkot (1592m) in Pokhara is the best among all. We would go for at least 30 to 45 minute flight which would provide an exiting experience that would cherish for the rest of life. 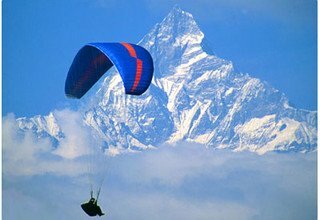 For those who want to find out what paragliding is all about , the pilot will explain and about it and teach its use so that it would be easy for anyone to control the glider. 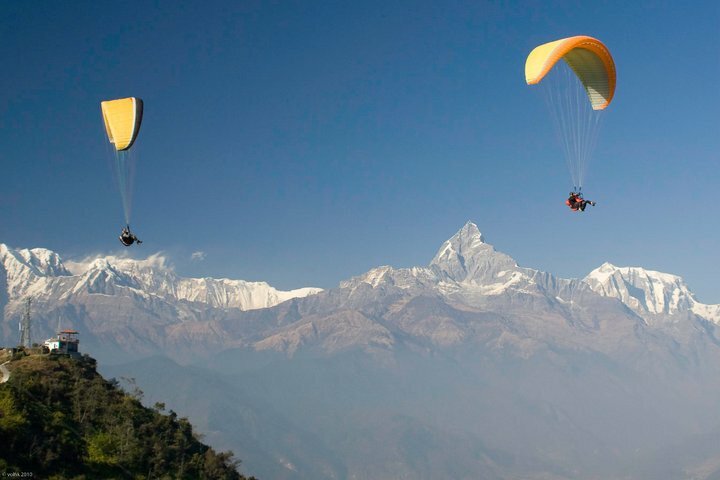 October to April is the best period for paragliding in Nepal. 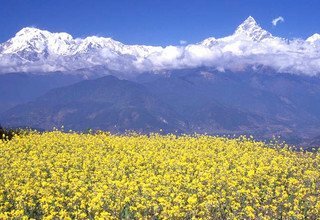 It is one of the best ways to view Nepal and its Himalayan panorama by a short flight from Sarankot. 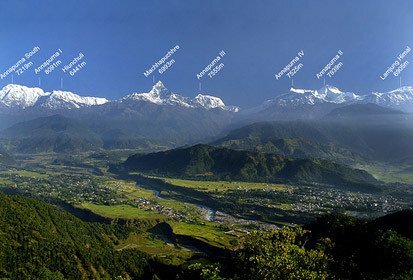 While on flight , one can observe the glory of Annapurna range and beautiful landscape around Pokhara valley, virgin Mt; Fishtail (Machhapuchhre), Lamjung Himal, Annapaurna Himal, Himchuli, Fewa Lake, Rice field, Rivers and settlements. Certainly, the flight gives anyone thrills with a great photographic opportunity. Arrival in Kathmandu Tribhuvan International Airport and you will be met at the airport by our representative who will be waiting with a Swiss Family Treks sign outside the terminal and transfer to Hotel by private car. Welcome drink and after you settle into the hotel there will be a group briefing with your tour leader. He will discuss the trek details and co-ordinate any last minute arrangements. If you are arriving in Pokhara by overland from Nepal-India Border and transfer to our booked Hotel. Stay overnight at Hotel. 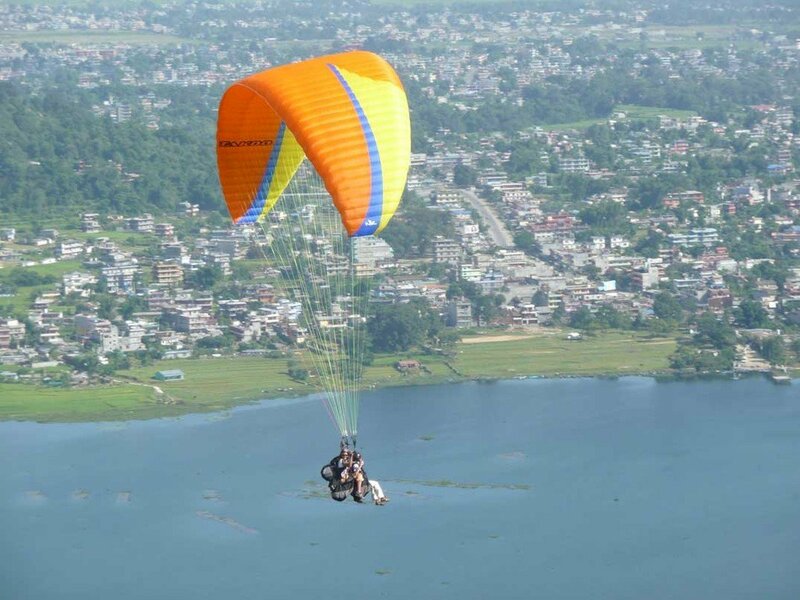 Day 2: Fly from Kathmandu to Pokhara 820m/25 minutes. 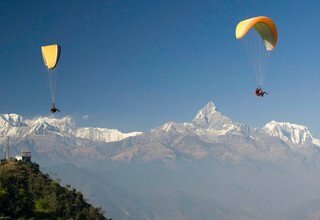 In the morning, we transfer you in the domestic airport and flight to Pokhara with scenic mountain views including Langtang, Ganesh Himal, Manaslu and Annapurna Massif and once reach the Pokhara valley, sightseeing tour in Pokhara with our guide in such a interesting places like as Davi's Fall, Gupteswor Mahadev Cave, Tibetan Refugee Camp and boating on Phewa Lake for an hour including visit of Tal Barahi Temple in the middle of the lake. 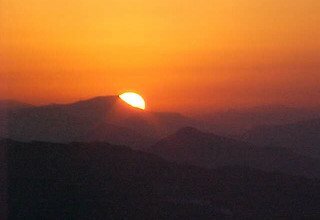 Late afternoon, drive from Pokhara to Sarangkot for Sunset View above the high Himalayan Range and stunning view of Annapurna Range, Dhaulagiri Range, Machhapuchhre and other snow-capped mountains as well as Pokhara Valley. Stay overnight at Hotel in Sarangkot. Early in the morning, hike to View Tower for Sunrise View over the Annapurna Massif and other high mountains. 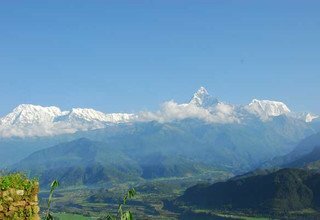 Enjoy with majestic view of Annapurna Range, Machhapuchhre, Manaslu, Dhaulagiri Range and scenic Pokhara Valley. Back to Hotel and have a breakfast. After breakfast, preparing for the Paragliding from Sarangkot to Pokhara Valley for an hour flight. Once you are landed from Paragliding and transfer to Hotel. Late afternoon, again our guide will bring you in other interesting places like as Mahendra Cave, Chamero (Bat) Cave, Seti River George and Bindabasini Temple by private car and stay overnight at Hotel. In the morning after breakfast, we will go to world peace stupa by car. 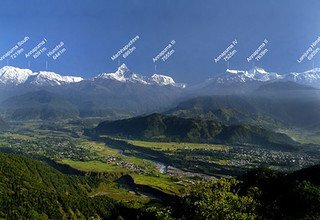 We can see panoramic view of high Himalayan range from Manaslu to Dhaulagiri range including Machhapuchhre and Annapurna Massif as well as scenic Pokhara Valley and Phewa Lake. Then, we will walk down to Phewa Lake through the forest which takes about 1 hour and take a boat to cross a Phewa Lake passing the small Island where Temple Barahi is situated middle of the Lake. Afternoon transfer to airport, and then fly back to Kathmandu. Our car will be ready to pick up in the airport and transfer to Hotel. 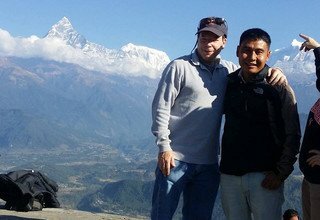 Day 5: Full Day Guided Sightseeing Tour in Kathmandu Valley by private van. * Domestic flight ticket KTM/PKR/KTM and domestic airport tax. * 6 nights accommodation with breakfast at 3*** Standard hotel in Kathmandu and Pokhara. 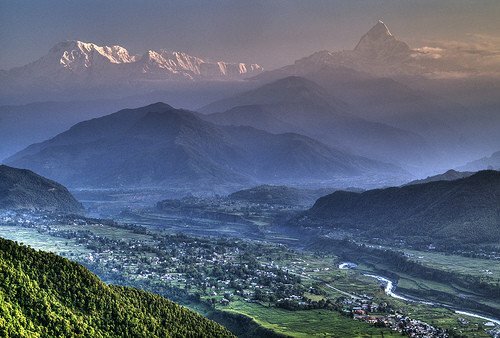 * Kathmandu and Pokhara city tour as per the above itinerary and all entrance fees. * Meals (breakfast, lunch and dinner) with Tea & coffee and hot water during the Pokhara Tour. * Guide & support staffs insurance and salary and insurance.